Free on Kindle for a Limited Time. Get your copy HERE! It’s completely FREE on Smashwords. In addition, I’ve added a couple short Christmas dramatic readings to it as well, plus some other goodies. Please pick yourself up a copy and I hope you enjoy. FREE CHRISTMAS STORY HERE! Here’s the synopsis: Christmas Eve, 1914. 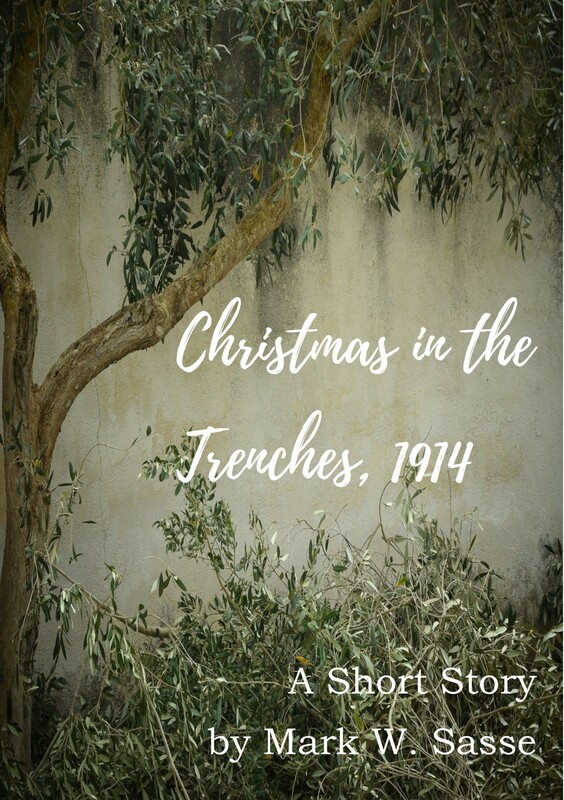 Young Private O’Malley, staring over the crest of a trench deep in the heart of France, regales his comrades with nostalgic images of home as he describes his parents’ Christmas preparations back in Brighton. But when a curious group of German soldiers singing Silent Night step out of the trenches and approach the British line of defense, O’Malley and his mates have to decide if there’s enough Christmas magic in the air which would allow the weary soldiers a brief respite from the ravages of war on the holiest of nights. Full Circle in One Week. The Story of my New Christmas Story. Just a week ago I was sitting in a pool thinking, as I often do before I start writing. As I previously mentioned, I was planning out 2015 and had decided to turn my one short play, “If Love is a Crime, String Me Up” into a Christmas story to publish in November of 2015. Then I had a crazy idea. It was still November 30 at the time and I asked myself if it would be feasible to write a quality story in a week so I could release it this year on the second week of December. I scoffed at the idea but decided to give it a try. Within 24 hours, I had a first draft nearly completed. This was fast! I never like to write and publish too quickly. A lot can go wrong, but there is something I had going for me on this project: I already had a quality story. The play that my new Christmas story (“If Love is a Crime: A Christmas Story) is based upon already had a complete story with three well-developed characters. The dialogue of the story was basically already there, minus the Christmas aspect, so I just need to flesh out the details and put the setting on Christmas Eve. I already absolutely loved the characters, and I had already seen them performing on stage two weeks prior to this. These were solid characters with a simple, but yet profound story to tell. So I moved forward. Here’s what I did throughout the week to get the story ready for publication. Monday – I contacted my book cover designer and asked if he had any free time to see if he could whip me up a simple e-book cover within a week. He did much better than that. By noon Monday, he had already sent me FOUR sample covers. Wow! Now I knew I had to write a quality story. By Monday night I had finished a first draft, which was, actually, too closely connected to the play and not closely connected enough to Christmas. Tuesday – I laid down some additional story twists and background information which was not present in the play. I figured out that Beatrice, our protagonist, was a widower. This is her first Christmas alone without her husband, Homer. I also brought in an angel gift that Homer had previously given her. It would now play a prominent role in the story. Wed – Re-read and re-write. I also coaxed my wife to read it, the first and only person who has read it at this point. She caught some things which needed changing to improve the flow of the story. She also caught my mistakes. Asked my book designer to add a little color to the cover. Done. Thurs – Re-read and re-write. Friday – Re-read and edit. Saturday – Double re-read. Also laid out the e-book and got it looking nice and pretty. Sunday – Re-read by both myself and my wife. And this is where I find myself. A week older, and now with a new story under my belt, ready to be released tomorrow. I hope it is an inspirational and meaningful read for people. I hope they love Beatrice as much as I do. What an incredible woman! You’ll see what I mean if you read it. This is not something that I would do all the time, rush a story to publication in a week. For my novels, it takes between 6 months and a year from the time they are finished to the time I push them out. I feel it’s necessary to take it slowly, ensuring the quality is where I want it to be. But with this one, I am confident that it is the story I want to tell. I hope everyone will like it. PURCHASE THE STORY ON AMAZON HERE! Blitz Publishing – My First Christmas Story Soon! It’s November 30th. I’m sitting in the pool at the Hard Rock Hotel just thinking as I usually do. Rehashing plot lines and pondering random story ideas. My mind happened upon one of the short plays I had written and produced a short while ago called “If Love is a Crime, String Me Up.” It’s a historical piece about a runaway slave in 1852. Quite moving, actually, with come great characterization. I was thinking how I could probably re-write it as a short story, and possibly even make it a Christmas story. Then I tucked it away thinking it would be something to write over the next six months or so and, if I like it, I could release it next November 1 ahead of the 2015 holiday season. And then it really hit me. Could I possibly write it for this year? No, certainly not enough time. But I remembered that it’s only November 30. Maybe I could whip it up. Possibly? As I was arguing with myself back and forth, I decided to get out of the pool and try writing it to see what would happen. I copied the entire script and then started pecking away at certain ideas and descriptions to see if it could be retro-fitted into a plausible story. A couple hours later and I felt hopeful. I went home and around nine p.m. looked at it again. After another couple of hours, I was three-quarters of the way finished with my first draft, and not completely unpleased with what I had written. In the morning I sent off a frantic message to my book cover designer and asked if it would be at all possible to have a simple book cover for this story within a week’s time. By noon, my amazing designer had four incredible samples for me to look at. Okay, this thing might be happening. Another couple hours this evening and I have completely given the manuscript a one-over and I’m 15 percent away from having a finished draft. And so I am, quite confident to announce that I’ll be publishing my first Christmas story on Kindle (hopefully) before December 10, 2014. This is such a cool time to be an author! Anyways, there’s still MUCH to be done on this little story which will probably settle in to about 6000 words or so. I’ll be writing drafts of it all week, and even hope to get some quick reader feedback. And then I’ll put it through my brutal last round of quality control to make sure that this is really a story I want to publish this quickly. But if all goes according to plan, there will be a sweet new Christmas story added to the annals of Christmas stories. I’ll keep you all in the loop and announce it’s arrival ahead of time. I hope it will provide a warm and uplifting feeling during this festive season. Blitz publishing. I don’t recommend it, but it is awfully fun every once in a while. 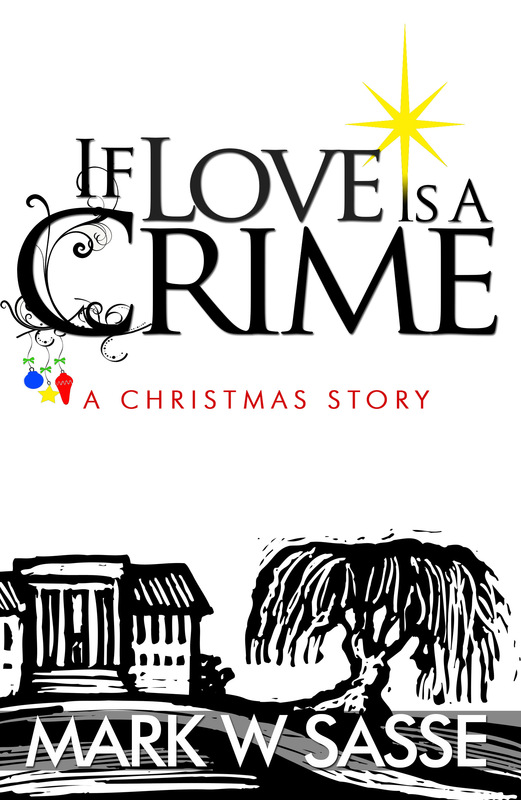 “If Love is a Crime: A Christmas Story” coming soon! My hometown paper, The Butler Eagle, asked me to write a very short, 450 word story for Christmas this year. I was honored to do so and doubly honored to have the finished result published on the front page of the newspaper on Christmas Eve. Besides the length requirement, they also asked that it reference something from Butler County, and I was more than happy to oblige. Their purpose: to bring some joy to the holiday season. I’m very pleased to re-publish the entire little story below: “The Angel on the Courthouse. 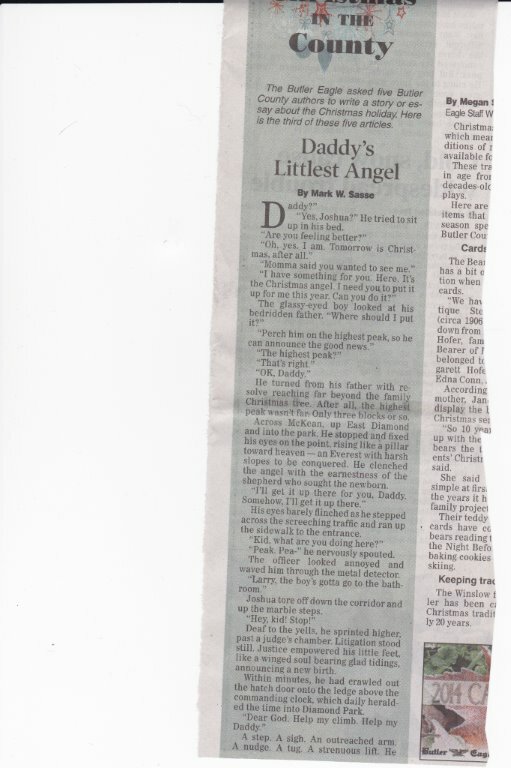 (Note: This story was published by the name “Daddy’s Littlest Angel” for the paper version. I’m not sure why.) Merry Christmas! “Yes, Joshua?” he tried to sit up in his bed. He turned from his father with resolve reaching far beyond the family Christmas tree. After all, the highest peak wasn’t far. Only three blocks or so. Across McKean, up E. Diamond and into the park. He stopped and fixed his eyes on the point, rising like a pillar towards heaven – an Everest with harsh slopes to be conquered. He clenched the angel with the earnestness of the shepherd who sought the newborn. His eyes barely flinched as he stepped across the screeching traffic and ran up the sidewalk to the entrance. “Peak. Pea–” he nervously spouted. The officer looked annoyed and waved him through the metal detector. Joshua tore off down the corridor and up the marble steps. Deaf to the yells, he sprinted higher, past a judge’s chamber. Litigation stood still. Justice empowered his little feet, like a winged soul bearing glad tidings, announcing a new birth. Within minutes, he had crawled out the hatch door onto the ledge above the commanding clock, which daily heralded the time into Diamond Park. A step. A sigh. An outreached arm. A nudge. A tug. A strenuous lift. He inched. Crawled. Tussled. Buoyed by more than hope. An untouchable peak. An invisible hand guiding the impossible climb. What happened next remains hotly debated to this day. Many on-lookers tell different versions about the brave explorer who conquered the courthouse peak. But they all agree. He clung to the spire with great ease as the angel waved gently in the Christmas breeze. Three hours and a precariously placed crane eventually undid the climb, bringing the boy back to earth, into the arms of an unexpected onlooker.